Congratulations! You have just purchased your refurbished C-Arm, CT, MRI, Cath/Angio, Rad room or other piece of medical imaging equipment and now you’re waiting to have it delivered and installed so you can start using it. You’ve selected technicians that know the modality in general, but they are not familiar with THIS manufacturer’s version of the equipment so you figure that you need applications training. That’s a great idea, but hold the phone for a minute! Unfortunately, your purchasing department does not want to cover the expenses to train your techs on top of the capital equipment they just shelled out for. You’d rather not have that money come out of your budget either, but your technicians MUST know how to use the equipment. What do you do? The first thing you should do is make sure you get a clear gauge on your techs’ knowledge. How much do they really know? You may need full-blown applications training, but you might also be able to get what you need from a system demonstration of use. “But what’s the difference?” you may ask. That’s an exceptionally relevant question and, coincidentally, the crux of the rest of this blog post. Applications training is generally included with the purchase of new imaging equipment from an OEM (though still charged for and built into the price of your system purchase). It is also available through third-party training groups. The applications trainer will walk through all aspects of the system including how to turn the system on and off, perform any required quality assurance tests, patient positioning, and they will often walk through several test cases with the customer demonstrating how to use the equipment for each study type. On more complex systems an applications trainer will customize the protocols for the particular studies that your facility will be performing. While this setup could be done by your in-house technicians, any missteps in this area can affect patient safety, so this route is not typically recommended. 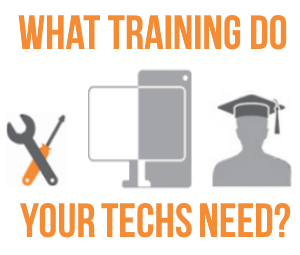 The applications trainer is often accredited and your techs can sometimes receive continuing education credits for the days that they are in training. The only thing we haven’t mentioned is cost. Applications training is not cheap and can vary anywhere from $1,500 to $5,000 per day – not including travel and lodging expenses for the trainer. Just like applications trainers are not trained to service imaging equipment, engineers are not trained to offer advice on clinical scanning techniques. If installation and demonstration of system use is included on your Block Imaging purchase contract, our installing engineers will provide a basic overview of system use and answer any questions about system functionality your technicians might have. The engineer will walk through how to turn the equipment on and off, perform a basic scan, and show the techs where to go for answers to other questions that may arise later. Unlike an applications trainer, the engineer will not customize protocols for the equipment, but will confirm the system is functioning to OEM standards. Customization would need to be done by a well-trained tech or an applications trainer. Many OEMs call this an “in-service.” This is a great refresher for experienced techs that already know how to work with the modality in general, but perhaps not with the particular system you've purchased. In addition, keep in mind that engineers cannot offer continuing education credits for technicians but, because the engineer is already onsite to install the system, there is generally no additional cost for a system demonstration on the day the install is completed. If your techs have a high level of familiarity with similar systems but could use a briefing on the particulars of your new purchase, simply scheduling all of them to be on site at the end of the install could save you thousands. As you continue to wait for the arrival of your new imaging equipment, we suggest you talk to all of your techs and really get a feel for what they do and do not know. Applications training can be wonderfully informative for those who need it, but it can also be woefully, unecessarily expensive for those who already know what to do in the exam room or the OR. Whatever you may need to prep your team, we can help you get started in the right direction. You can reach out to us with the form to the right and we can get you connected with the right personnel for the right training. Danny Fisher is a Project Manager at Block Imaging. His goal is to understand the unique needs of each project and deliver a detail-oriented execution. When he’s not in the office, Danny enjoys spending time with his wife, catching up on the latest movies/TV, and staying in the know on the latest tech gadgets. He also loves finding great deals and inexpensive ways to travel the world!